All eyes on you in this modern day Cinderella ball gown by Vizcaya 89135. 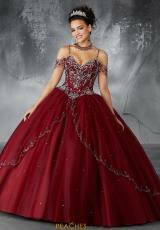 Glamorous beading decorates the bodice and dainty cap sleeves, shimmering throughout the night. A corset back keeps you in place all night long as a full tulle skirt flows out from the waistline, offering a delicate front split overlay which is adorned with sparkling beading. Matching stole included. Shop for more Vizcaya dresses at Peaches Boutique in Chicago.